Video footage of NFL star, Ray Rice, pounding his fiancée in an elevator has gone viral in recent weeks and caused an outcry within NFL and the American public in general. The incident which happened in February and was dismissed then as a ‘mild physical altercation’ has since proven to be severe as footage revealed Rice dragging the limp body of his unconscious fiancée (whom he has since married) out of an elevator. Viewers described this as ‘shocking’. What is shocking to me is the uproar this has created simply because the victim in question happened to be engaged to and then married a professional footballer. What about the countless number of women who are beaten to a pulp daily by their less than famous partners? Everyday women with everyday monsters parading as men? A few months ago, a random South African woman made headlines for being stabbed 50 times by her estranged husband and left for dead in an office park. The story, encapsulated in less than ten paragraphs was visible for a day and then faded into obscurity. This was someone’s mother, daughter, sister and friend. A few weeks later, a woman was set alight by her drunken husband in a domestic dispute. She encountered 90 degree burns to her entire body and is now left in a vegetative state. This newspaper article made the third page of a publication and again, lasted for just a day. 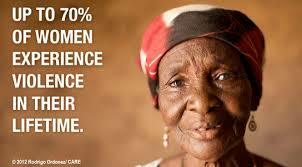 The prevalence of abuse against women, despite the activism that we as a society promote, is still on the increase. One punch to one woman is too many. The question I find myself asking is what sort of men are we raising? The paradox of being successful in a career but wanting to be dominant within a relationship is something I don’t understand. It is reported that about 70% of women will experience violence in their lifetime, yet this incident with Rice proved to be ‘shocking’ to audiences – simply because people witnessed it personally, having seen the leaked video. Does this make violence more real? Do we need to physically see a woman being beaten to appreciate the full horror of it? As a mother to a little boy, I have a role to play in ensuring that he is raised to respect women in every way and form. The way a child lives will ultimately determine their moral compass – children learn what they live. Stop the cycle of abuse by ensuring that we raise men that are secure within themselves to not feel emasculated by strong women or who feel the need to resort to violence to intimidate women. More than that, women who are trapped within these abusive relationships need to know that there are ways to get out. You are worth more and deserve more than being dragged like a piece of luggage on a dirty elevator floor, followed by a half-arsed apology.